Thank you for your interest in volunteering at Villa! Volunteers are a vital part of Villa's day-to-day operations and we are grateful to all of our volunteers who donate their time to help. Each year, volunteers donate over 5,500 hours across Villa's programs, working directly with clients and helping in our administrative offices. Individuals and groups such as businesses, corporations, nonprofit organizations, charity groups, etc., are all welcome. If you are interested in volunteering, please scroll down for more information. 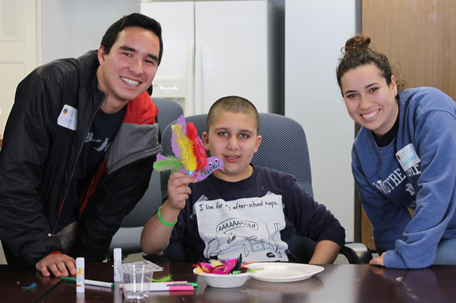 Experience what Villa does first-hand by volunteering to work in one of our programs where you can add joy and meaning to the lives of Villa's children, adults and seniors with intellectual/developmental disabilities. 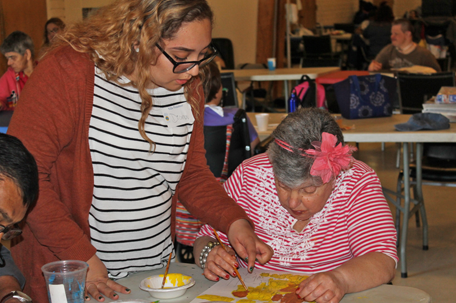 Provide friendship while assisting children in the classrooms at Villa School, or helping adults and seniors at our Adult Day Programs with arts, crafts, exercise, music and other activities. Please note - Due to space constraints, placement in Villa School classrooms and Villa's Speech & Language Center can be limited and is offered on a first come first serve basis. To volunteer in Villa's Occupational Therapy program, please contact the Volunteer Coordinator to be put on the wait list. Program Volunteer Hours: Monday-Friday 9:30 am to 2:30 pm. Special projects can be organized on our campus. Arrangements can be made via the Volunteer Coordinator. Good with a hammer, a saw, a brush, and/or a shovel? 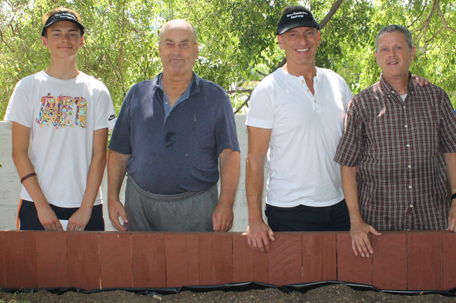 Villa is always looking for volunteers to help beautify our campus and residential homes. If your company, organization or other group is looking for a job to do as a team, then come on down and paint our buildings, plant some trees and flowers…the possibilities are endless! Eagle Scout, Girl Scout Gold and Silver Award, and senior projects are also welcome. Improvement Project Hours: Monday - Friday 8:30 a.m. - 4:00 p.m. / Weekends upon request - Must be arranged in advance with the approval of Villa staff. Good with numbers, answering phones, filing, or are you computer savvy? Put your skills to good use by helping out in our administrative offices in Pasadena and Thousand Oaks! Volunteer hours are available in our Finance, Development, and Human Resources departments. Administrative Volunteer duties may include filing and organizing documents, assisting with copying and mailing documents, basic data entry, fundraising and grant research, hands-on creative projects for events, and assisting with Villa events. Administrative Volunteer Hours: Monday-Friday 9:00 am to 5:00 pm. Read over the Volunteering Opportunities (left) to make sure volunteering at Villa is the right fit for you and/or your group. 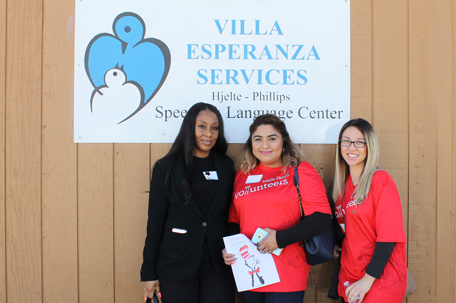 Contact Volunteer and Special Events Coordinator, Lindsey Harrison, at LHarrison@VillaEsperanzaServices.org or (626) 449-2919, ext. 162 with your volunteer request. Lindsey can also answer any questions you might have about volunteering, special projects, one day volunteer events, etc. Once you have confirmed with Lindsey, fill out a volunteer application (or a one day application if volunteering just for one day). Attend a Volunteer Orientation Session. Bring your completed application to the orientation where you will learn more about Villa and receive a tour of the organization. After the orientation, you will work directly with the Villa program staff you have been placed with to schedule your volunteer hours.